Sure staff meetings can be less than thrilling, but imagine you are sitting in a conference room where everyone is speaking a foreign language. For nearly an hour, your brain works overtime to discern even the most mundane aspects of conversation. Or perhaps you are in a class lecture, where the only material you understand is the supplementary PowerPoint: how terribly dull! With millions of deaf/HoH individuals living and working in the United States, all-inclusive events are finally becoming a societal standard. As someone who understands diversity and supports the use of deaf language, you’re more than happy to provide equal access in your establishment. But as a hearing individual, maybe you’re just not sure where to start. As discussed in my previous blog, supplying a quality interpreter at your event is not only considerate, it is crucial to providing equal access. Most deaf individuals gather information best through deaf communication, including ASL. Although pamphlets and slideshows can be great; your deaf employee, student, or patron is really going to miss out on the full experience without an ASL interpreter available. 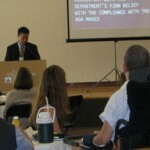 To create equal access, any event open to the public should have an interpreter. Period. Private events should be clear on all promotional materials that an interpreter is available upon request. Be sure to let your potential deaf patrons know beforehand that they are completely welcome, and will be happily accommodated! Deafness is not limited to special events, so providing access in the public sphere would be a logical next step toward equality. 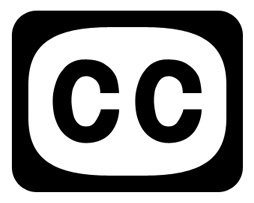 Captioning services ought to be provided everywhere, including busses, airplanes, and subways. No excuses! Deaf people are not disabled, they do the same things hearing people do, and it is important to remember that anywhere instructions or warnings are required. On a more personal level, take a moment to think about the deaf patients sitting in your waiting room, or hospital bed. Is there closed captioning on the TV? What about your deaf bar patrons, have you captioned the football game for them? As a movie theatre manager, have you thought about regularly offering captioned opening-day screenings of the latest films? Yes, as individual acts these may seem small, but it’s these little considerations that go a long way toward creating an atmosphere of equality! In a professional environment, creating equal access means ensuring your deaf employees can perform the same tasks as their hearing counterparts, and that deaf clients can easily contact your company. Of course, e-mail and instant messaging have become standard, which works well for simple deaf-to-hearing communication. But for dialogues, discussion, or debates, usinsg simple text communication isn’t always efficient. The telephone was a revolutionary device for hearing individuals, and video relay has helped Deaf/HoH people make use this common communication method. Video relay companies, such as the deaf-owned Convo and ZVRS, are utilizing modern technologies to provide video interpreting services on a number of platforms. This allows for a more fluent phone conversation between deaf and hearing individuals, even within the same office. When everyone feels comfortable communicating, everybody wins! If you find yourself frequently interacting with Deaf individuals, it’s a great idea to learn some basic ASL. I offer one on one ASL training in the greater NYC area, and video lessons via Skype. I am also available for ASL interpreting services, so please do not hesitate to contact me for a consultation!